Dear whisky lovers, we have in the past months carefully matched two products which are wonderful on their own but when put together create an even better sensation. Behold, the WCL's 2015 whisky and chocolate experience kit. Each pack contains a brochure further detailing the Whisky, the Chocolate and the fun we had as Committee whilst finding the perfect match in each case. The box will be on sale for 40€ per kit. We can ensure you it's an awesome experience, both for more experienced whisky enthusiasts as well as for beginners. Based on the feedback we shall receive this year, we are aiming at releasing a dedicated box each year. You can order the kits as of now by sending us an email to info@whiskyclublux.com. Unfortunately we don't do shipping, but you can either pick up your box at our registered office or we'll figure something out. Pursuant to the summer break, we offer you some real gems as two of the newest bottlings. The first one was exclusively selected by us and the Morgan Club Luxembourg and the second one is all ours. Both of them are Signatory bottlings which means that no colour is added and they are not chill-filtered in order to ensure you the natural taste of the Whisky as it is. Both bottlings were tasted and selected by us beforehand and we are mighty proud of what we have to offer. 1. The first bottle is a 1995 Imperial which has been in the cask for almost 20 years. Imperial being a closed distillery, there is only so much whisky left and we got about 292 bottles out of the cask of which we can offer you about half. Members of the Morgan Club Luxembourg will rejoice that they also have access to this fantastic Whisky. If you had Imperial before, you will notice that it is a typical Imperial, which personally I quite like, as it is light but determined. The Whisky is bottled at 49% alcohol. Price for members is 75€. You may buy more than one. 2. 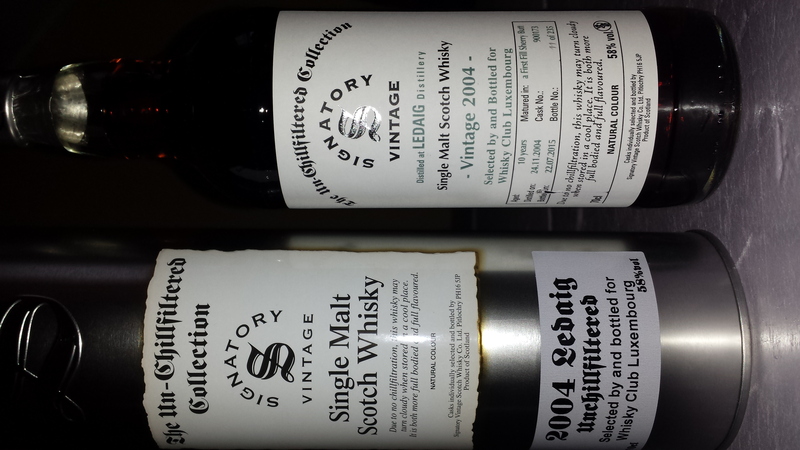 The second whisky is a Ledaig (the name of all peated whisky coming from Tobermory distillery on the island of Mull), with the interesting combination of peat and first Fill Sherry cask. 235 bottles were filled from this cask at 58% alcohol. The price is here also 75€ per bottle and it is possible to buy more than one bottle. Reservations are now open for our special Whisky Dinner on Friday 20 November 2015. The price for the menu with Whisky is 90 € per person. Please specify in the transfer that it is for the "Bel Air Whisky Dinner" and the number of people you are reserving for. All the whiskies you will taste on the night will be available to buy through our partner who will be present. Start will be at 19.00 with the Introduction and the Apéritif will follow soon afterwards.